My little guy turned 3-years-old earlier this month. Since he’s my “wild child” I knew that he would love doing something active to celebrate his special day. 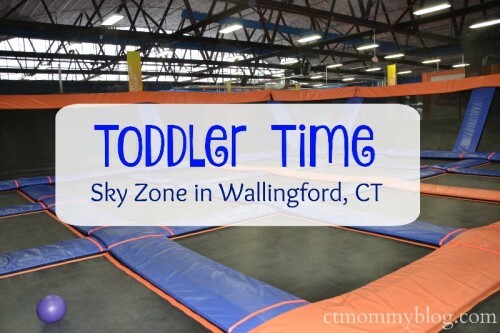 With the unpredictable weather in March it needed to be some sort of indoor play area so Sky Zone in Wallingford, CT was the perfect choice. 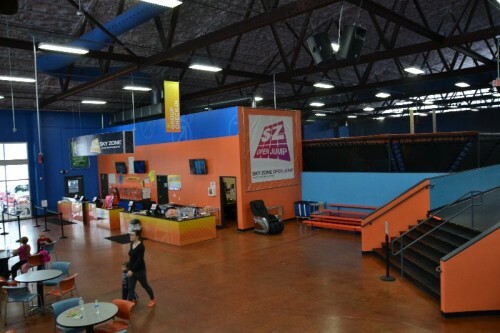 I had heard great things about Sky Zone and it surely did not disappoint. 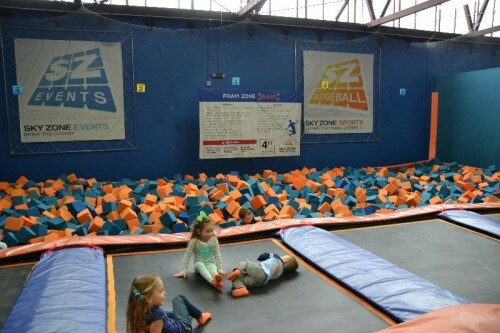 Sky Zone is an indoor trampoline park that offers open jump, private events, birthday parties, fitness classes, and toddler playtimes. 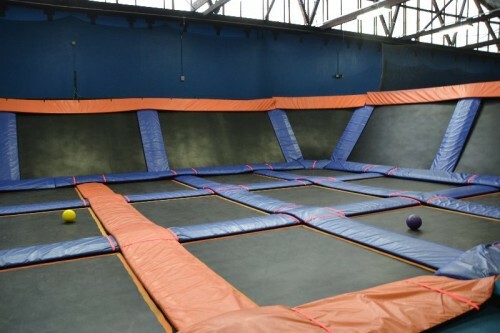 Inside they have giant trampolines, basketball, dodgeball, volleyball and a foam pit. It’s great for all ages. They even offer a special toddler time twice per week making it extra convenient for busy families’ schedules. 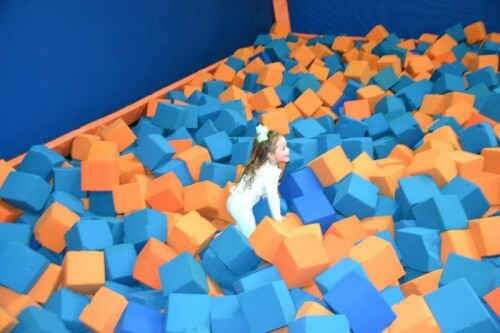 Little ones ages 5 and under get the chance to jump and play without the fear of bumping into the big kids. Tickets can be purchased online or in person. The cost of admission is $10 per child. You are also required to wear special Sky Zone socks that can be purchased for an additional $3 per pair (including adult socks). TIP: Buy the socks once and keep them in your car or diaper bag. You never know when you’ll make a spontaneous trip back! Each guest is also required to fill out a waiver (online or at a kiosk) before participating. Little ones wear stickers on their backs marking that they have paid for admission. 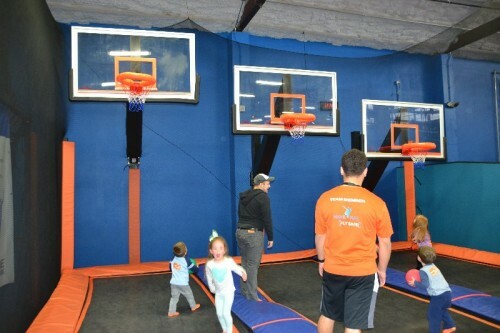 There were three main jump zones open during Toddler Time: trampoline, basketball, and foam pit. Each area is monitored by (at least) one employee. 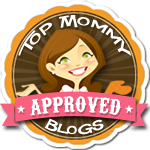 Parents/caregivers can go on the trampoline to supervise but they are not allowed to bounce. This was especially hard when you feel the bouncy trampoline beneath your feet but I understand the safety concerns. There are plenty of tables and chairs available in the main area available for water breaks or if someone wants to sit out for a bit. There’s also a concession stand to purchase snacks and drinks. 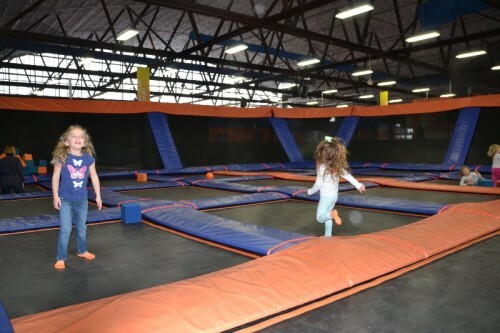 The trampoline area is a huge wall-to-wall open space full of bouncing fun. Kids could jump from end to end. We spent most of our time here bouncing around, and playing with the balls and foam blocks. 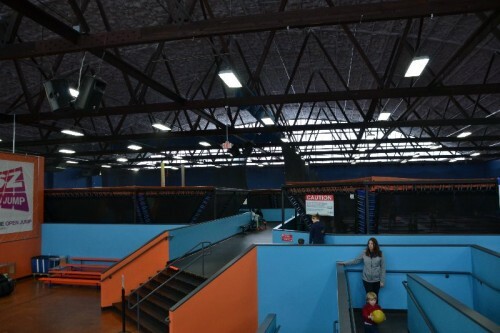 The basketball zone has 3 hoops at various heights. 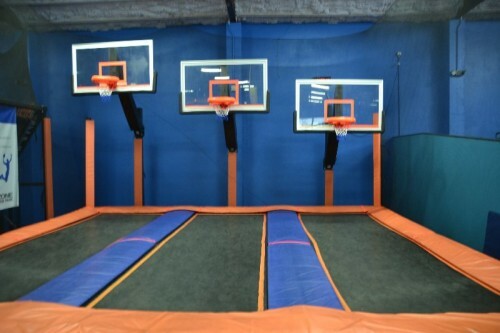 There are trampolines under each net to give added height when scoring a basket. My kids (and husband) loved jumping and trying to score baskets. The foam pit reminded me of a swimming pool full of soft foam blocks. Kids could dive into the blocks and “swim” around. Adults were able to get in on the action too. TIP: Make sure to keep an eye on your pockets! I can only imagine how many phones and keys get lost in that pit each day. There are lockers in the main area to store belongings. We had an awesome time at Toddler Time. It was the perfect active birthday celebration for my busy boy. I love that it’s a special time dedicated to toddlers where we don’t have to fear big kids bumping into us. We’ll definitely be back to burn off some energy in the near future.